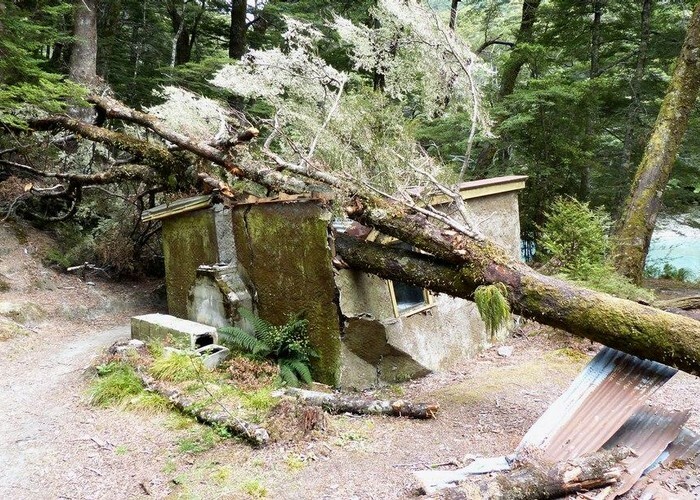 DOC advises that the Rockburn Hut is closed "due to adverse weather conditions"
.... and a fairly solid tree ! Honora We stayed here in preference to camping outside in the rain unlike others. We were entertained by a mouse doing a traverse of the fireplace surround. Very pleasant evening but the hut does (did) resemble a bunker. I'm sure it won't be replaced. Oops, the 2/4 rating was meant to be for the hut, not the photo - sorry! Added 15 March 2013 by bernieqbernieq. No revisions.